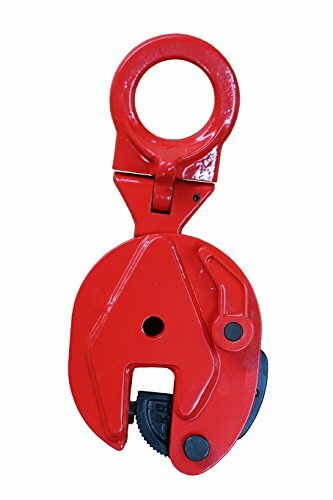 MAG-MATE K020T No-Twist T-Handle Multi-Purpose Lever Clamp, 2"
MAG-MATE K030T No-Twist T-Handle Multi-Purpose Lever Clamp, 3"
Amarite Vertical Plate Clamp, 1760lbs,4409lbs Working Load Limit, Jaw Opening up to 0.6",1"
Easily extend your reach: adding 32" to your reach, the suction Reacher allows you to easily reach items stored on high shelves, dropped behind furniture or other tight places, and items on the ground without constant bending and twisting. Great for those with limited dexterity, arthritis, carpal tunnel, or those recovering from surgery or injury. Secure rubber suction cup tips: easily change light bulbs without using a hazardous step stool. Strong rubber suction cups provide a secure grip on any item, including smooth or slippery objects like glass or metal, without damaging the surface. The wide leaf-style jaws close tight enough to retrieve dropped Coins or pills with ease while having the strength to hold items weighing up to five pounds. 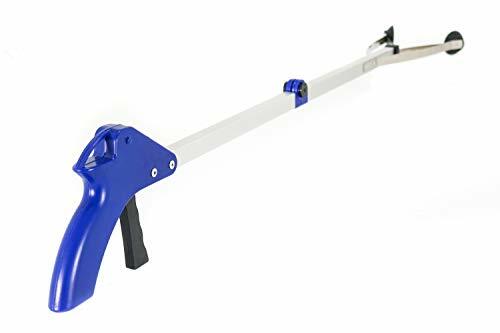 Ergonomic trigger handle: the comfort grip handle is ergonomically designed to fit easily in either hand for versatility and also includes a built-in hanger for convenient storage when not in use. 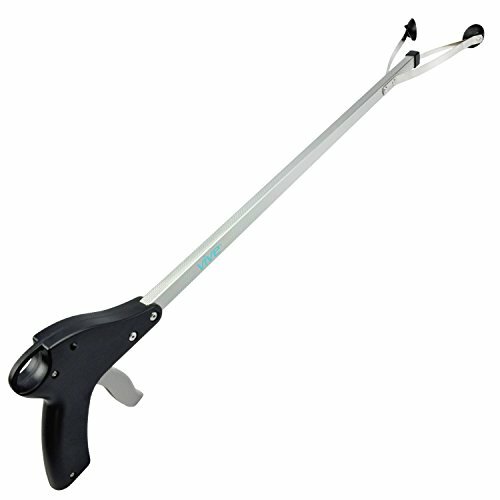 Lightweight and durable: constructed with a durable, corrosion-resistant aluminum, The suction Reacher is is suitable for indoor/outdoor use. The frame is lightweight to reduce arm and hand fatigue from constant use. Product Description: Use the cup on clean, relatively smooth, nonporous surfaces, at temperatures from 10 to 120 Fahrenheit. Moisture or contaminants can reduce the slip resistance of the cup. The red-line indicator may not perform reliably at elevations above 5000 feet. To Attach 1) Position the hand cup on the contact surface so the red line will be visible if it should appear while lifting the load. CAUTION: Test the cup for staining or deformation of load surfaces with light colors or soft coatings. 2) Pump the plunger until the cup attaches completely. When the red line is hidden, vacuum is sufficient for lifting. 3) Check the plunger frequently to make sure the cup remains securely attached. If the red line appears while lifting, set down the load immediately and pump the plunger until the red line is hidden again. To Release 1) Set the load on a secure support. 2) Press the valve release lever until the cup disengages completely. Maintenance Since aging and wear reduce the capacity of the rubber pad, it should be replaced at least once every 2 years or whenever cuts, slits or other surface damage is discovered. Always inspect vacuum pads before use. Clean vacuum pads and the load surface between each lift. Make sure both surfaces are dry and no dirt or obstruction. Make sure plunger has enough lubrication for pump. Warning: Do not use suction cup for climbing nor pull up. Damo Diamond Tools, LLC is not responsible for any personal injuries and property damages due to incorrect usage of our products according to our Instructions. 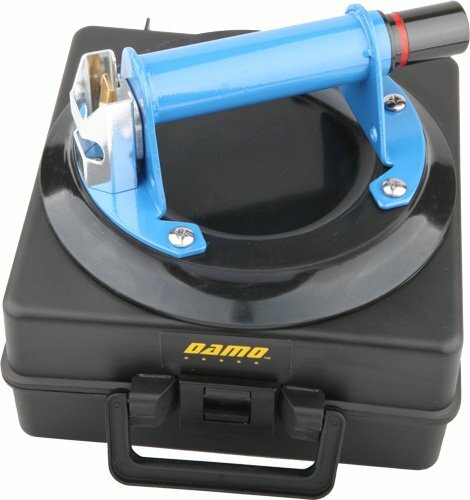 Brand: DAMO | Manufacturer: DAMO Diamond Tools LLC. Foot operated lifter to support door while fitting into door frame. Foot operated freeing up the users hands. Slides under door and stays flat and stable until ready to activate the lift with users foot. Lifts door 1-1/2 inch (38 mm) high and maximum weight 240 Ibs (108 kg). Made from plastic and non marring. Cam design with internal weight to keep level for ease of use. Ideal for pinned hinges. Hanging hole for storage. Extra care needed with veneered doors. No need to use a chisel and bolster. Can be carried in a tool belt. 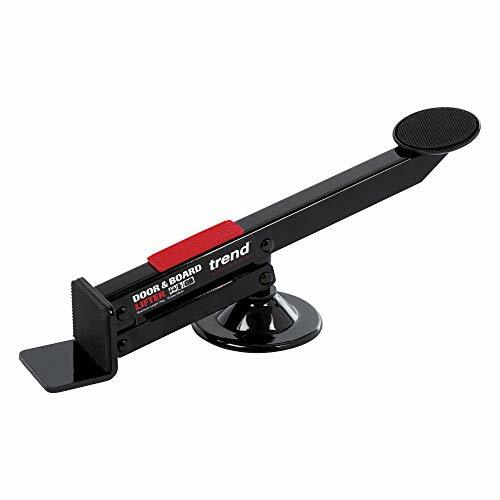 The door and board lifter allows up and down and side to side movement for easy positioning of doors, panels and drywall boards. Assist Tool This handy assist tool helps to pick up items with ease avoiding the use of ladders, uncomfortable bending positions and allows you to grab items you don't want or can't touch. 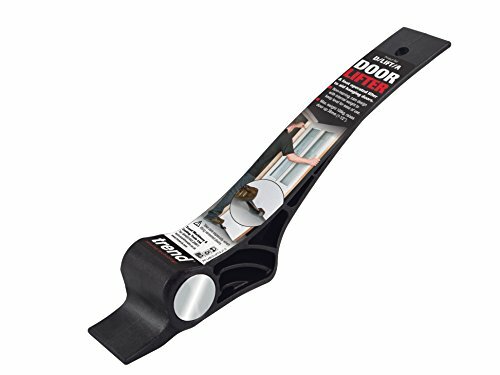 Lock On and Off Features The double lock-on and lock-off features helps to keep a firm grabbing, ideal to remove light bulbs, hold items ready to lift without pressing the trigger. Dual Steel Clips The strong dual steel clips help to secure the items keeping them in a steady but gentle pressure. Rubberized Suction Cups The rubberized suction cup grips allow to carry items with confidence, they are smooth with the surface of the item making them glass and other fragile and slippery materials friendly to grab and pick up. Brand: HN Square | Manufacturer: MLRJ International Inc.
Will not "walk-off-center" when pressure is applied. Kant-twist eliminates distorting and twisting action of c-clamp. Cantilever action provides 4:1 clamping ration. Three different gripping surfaces. Built-in "v" block for round stock. 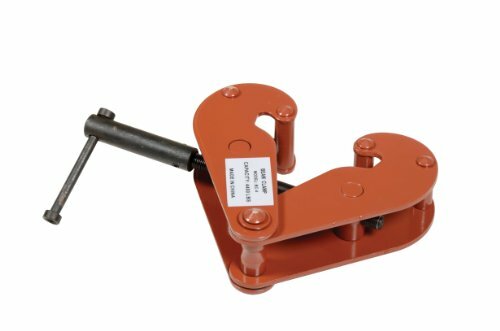 Heavy-duty plate clamp is designed to vertically lift and turn plate material from all positions. 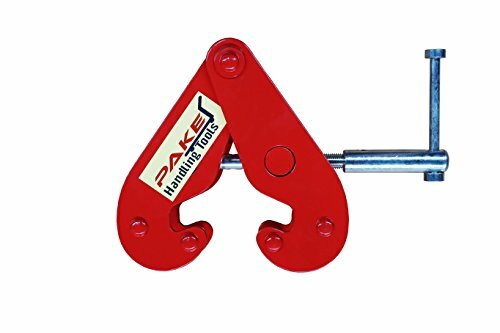 Lifting clamp includes an articulating shackle for versatile, smooth operation and automatic serrated hardened steel pads and cams. Clamp features a safety mechanism that ensures the clamp does not slip when lifting force is applied or when load is lowered. Drop-forged carbon steel case offers maximum strength. Meets ASME B30.20 specifications. 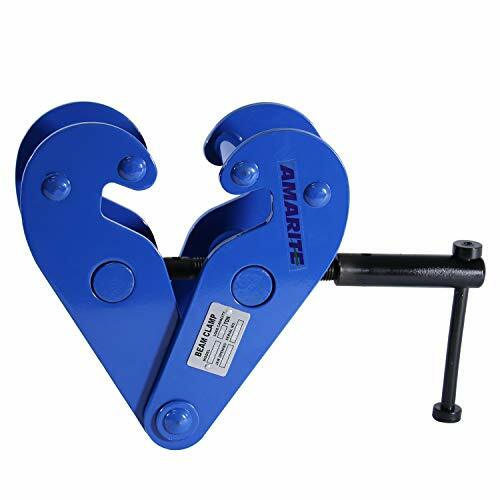 Amarite 1760 LB universal plate clamp has 0-0.6" jaw opening, perfect for lift and moving heavy plates. Amarite and its group factories specialize in the field of Material Handling & Lifting products with significant worldwide presence. Amarite is dedicated to innovation, quality and service. Not designed to use on stainless steel or aluminum plates. For use only with materials with a surface hardness below HRC 30 (HB 300, Brinel 1300). To Attach 1) Position the hand cup on the contact surface so the red line will be visible if it should appear while lifting the load. CAUTION: Test the cup for staining or deformation of load surfaces with light colors or soft coatings. 2) Pump the plunger until the cup attaches completely. When the red line is hidden, vacuum is sufficient for lifting. 3) Check the plunger frequently to make sure the cup remains securely attached. If the red line appears while lifting, set down the load immediately and pump the plunger until the red line is hidden again. To Release 1) Set the load on a secure support. 2) Press the valve release lever until the cup disengages completely. Maintenance Since aging and wear reduce the capacity of the rubber pad, it should be replaced at least once every 2 years or whenever cuts, slits or other surface damage is discovered. Always inspect vacuum pads before use. Clean vacuum pads and the load surface between each lift. Make sure both surfaces are dry and free of any dirt or obstruction. Make sure plunger has enough lubrication for pump. 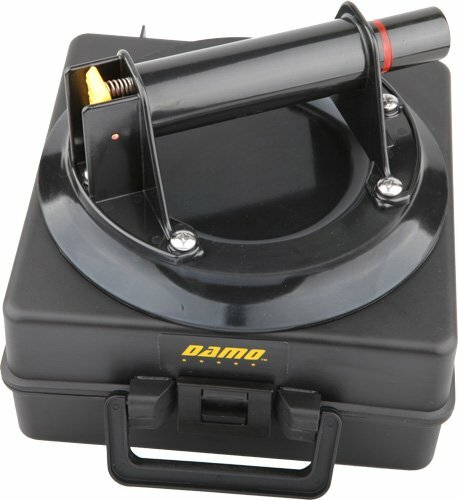 We DAMO Diamond Tools, LLC holds exclusive distribution to DAMO Trademark products as you can see clearly marked from the picture on the product listing. Designed for lifting plate material in horizontal position. Heavy-duty steel construction for years of reliable use. Meets ASME B30.20 specifications. 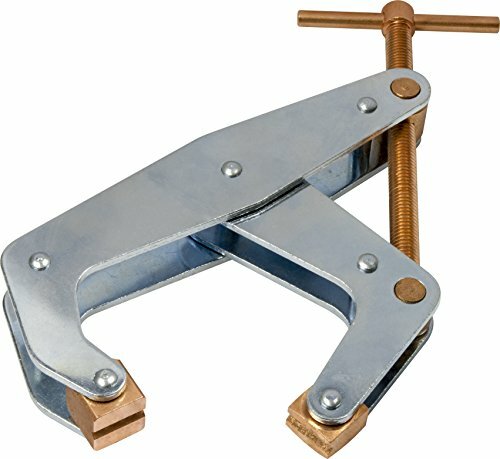 Do not use plate clamps to lift loads less than 20 percent of rated capacity. Lift only one plate at a time. Plate must be clean and free of oil. 400 Pounds min uniform plate weight. Not designed to use on stainless steel or aluminum plates. For use with materials with a surface hardness to 30 RC (300 HB). Lift only one (1) clean and oil free plate at a time. Two way pull operation. Drop forged construction provides more pulling power. Self-tightening serrated jaws for a positive grip. Perfect to use in confined spaces. Pulling Capacity: 2 ton for straight way, 1 ton for cross way. Pivoting bale for easier and more versatile operation. Automatic serrated hardened steel cams and pads. Drop-forged steel case for maximum strength. Designed to meet ASME B30.20. Warning: Do not exceed the working load limit. Serious bodily injury or property damage may result. 800 lbs minimum plate weight. 2.9" Throat depth. Not designed to use on stainless steel or aluminum plates. For use with materials with a surface hardness to 30 RC (300 HB). Designed to reduce the I-beam flange stress by distributing loads away from the flange edges during overhead lifting applications. These versatile units can be interchanged from one gantry to another in a matter of seconds with its easy mechanical adjustment mechanism. A bar is located at the bottom of the beam clamp for attaching a hoist (sold separately). Steel construction and painted finish. 3-1/8" to 9-5/8" Beam flange width. 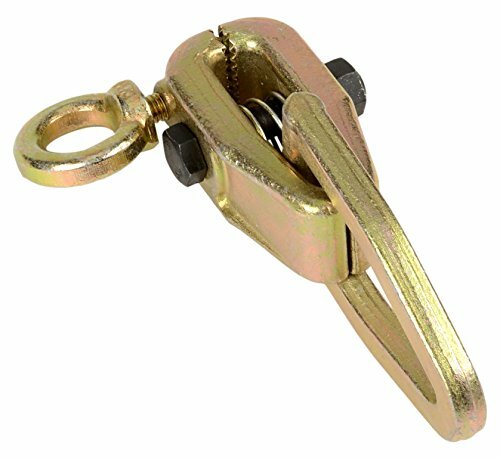 The Jumbo Beam Clamp is also a great option for your rigging application. This clamp line features a wide jaw opening for wide flange beams used throughout the industry. The JBC's clamp screw assembly is also zinc plated. 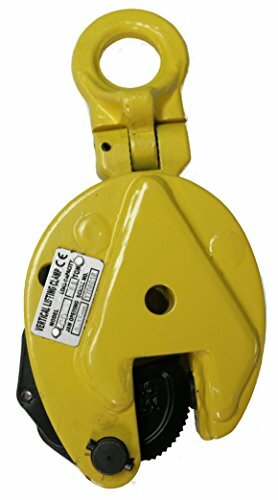 This clamp features 5 ton metric capacity. 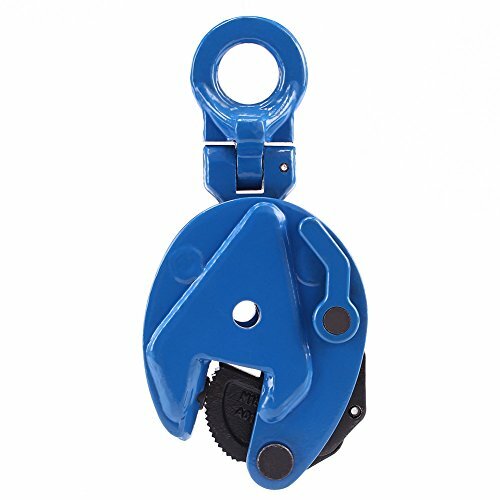 The eye beam clamp can be used as an anchor for various applications. 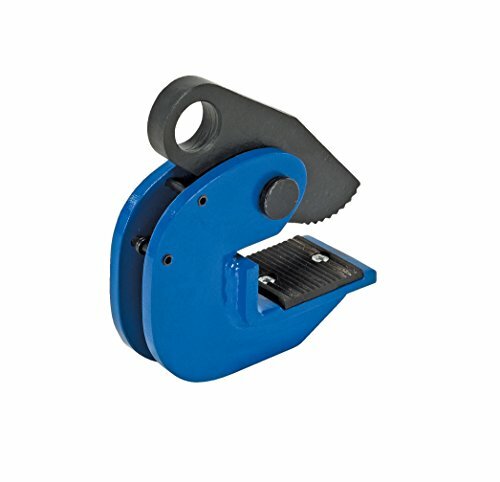 This clamp is ideal for any type of construction. 3 metric ton capacity. The zinc plated clamp screw assembly allows for easy adjustment of the clamp. 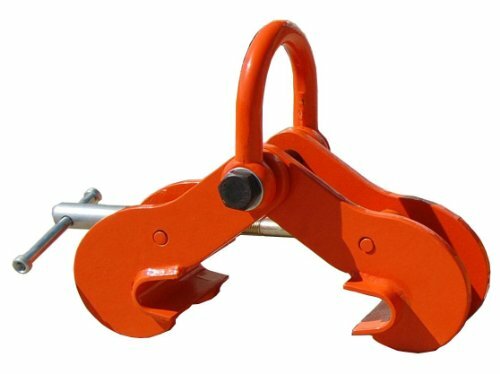 Provides temporary or permanent mounting point for hook mounted hoists or lever pullers. Versatile jaws designed to mount on a wide range of tapered or flat beams. Built-in suspension bar allows for low headroom. Easily installed and adjusted by hand. Designed to minimize stress applied to beam.